Deputy Defense Secretary Paul Wolfowitz issued an unusual apology Thursday to war correspondents in Iraq after saying they reported rumors because they were too afraid to leave their Baghdad hotels. In a letter provided by a Pentagon spokesman, Wolfowitz wrote: "Just let me say to each of you who have worked so hard and taken such risks to cover this story, I extend a heartfelt apology and hope you will accept it. "I understand well the enormous dangers that you face, and want to restate my admiration for your professionalism, dedication, and, yes, courage." On Tuesday, in testimony before the House Armed Services Committee, Wolfowitz agreed with statements by Rep. Jim Saxton, R-N.J., that the news media's focus on violence in Iraq has eclipsed reports of progress there. "Because frankly, part of our problem is a lot of the press are afraid to travel very much, so they sit in Baghdad and they publish rumors. 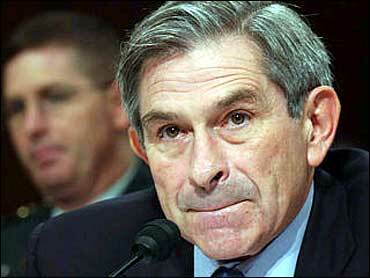 And rumors are plentiful," Wolfowitz said. After criticizing Arab media outlets, he added: "And I think our own media have some responsibility to try to present a balanced picture, instead of always gravitating for the sensational. And the violent is admittedly sensational." In his letter, Wolfowitz said he was trying to express frustration over "erroneous coverage of one particular news story," but his words came out wrong. It isn't clear from the letter or the transcript of his testimony what coverage he was referring to. Wolfowitz said in his letter that 34 journalists have been killed covering the war in Iraq, and noted some were "almost killed" when they were with him during an insurgent attack last October at the al-Rasheed Hotel. "Our hopes now are that through your efforts and those of coalition military and civilian forces, the nation and the people of Iraq will someday know the full blessing of liberty, especially a robust and prospering free press," Wolfowitz wrote.